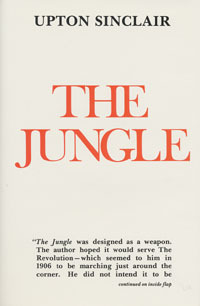 Upton Sinclair made his reputation with The Jungle, the most powerful muckraking novel in American literature. His shocking revelations about the meat packing business triggered the investigation of the industry by the Roosevelt administration in 1906, and led to the passage of the Pure Food and Drug Act the next year. "The Jungle was designed as a weapon. The author hoped it would serve The Revolution - which seemed to him in 1906 to be marching just around the corner. He did not intend it to be a work of art, and any attempt to consider it as a specimen of belles lettres would be preposterous. As things turned out, his novel became a useful tool in a moderate but long-sustained drive for reform.